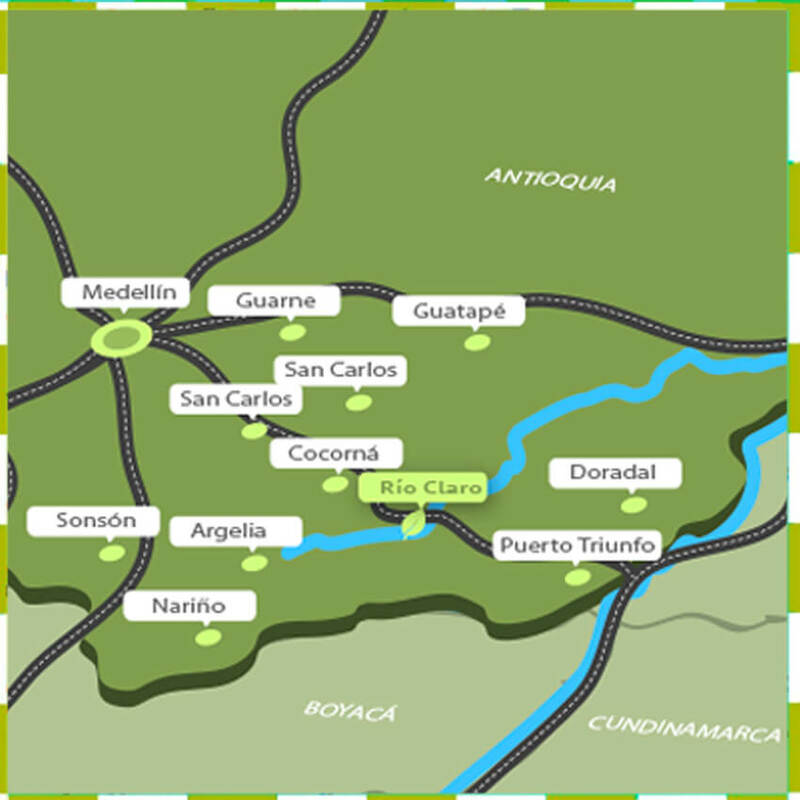 The Río Claro Nature Reserve is located in Colombia, within the department of Antioquia, in a region known as the Magdalena Medio (Mid- or halfway between the Magdalena River´s fountainhead in the south, and its delta in the North). 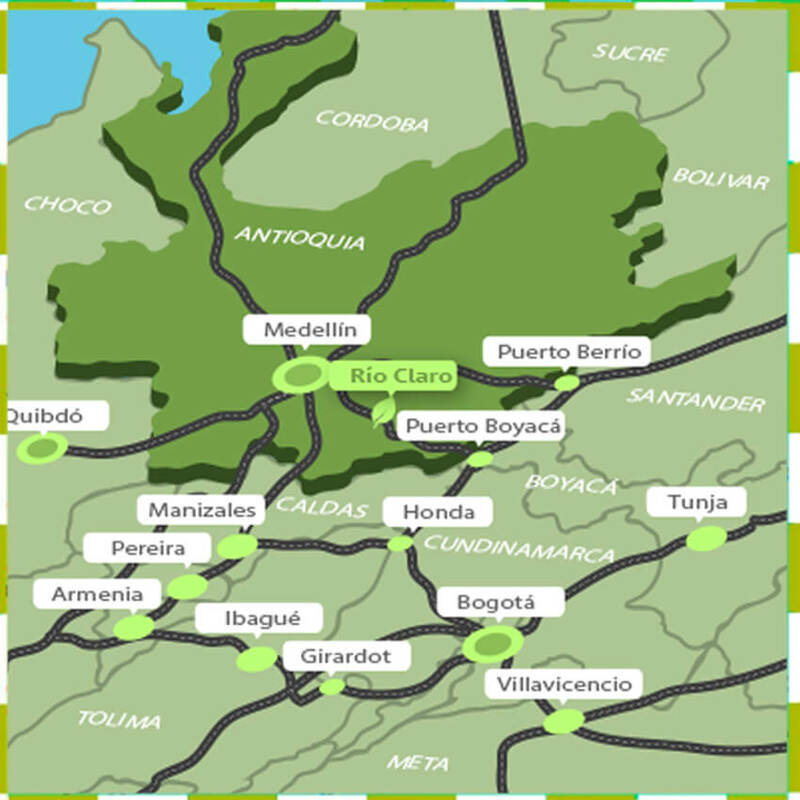 The entrance to the reserve is intersected by the Autopista Medellín-Bogotá (Medellin-Bogotá highway) at roughly one third of the way between Medellín (152km) and Bogotá (264km). Río Claro itself forms a watershed that runs down the eastern slopes of the Central Andes, spanning more than _-_-_-_ hectares of land belonging to the municipalities of San Francisco, San Luís, Sonsón, and Puerto Triunfo, in the department of Antioquia. Río Claro´s waters form in the highlands of Sonsón, on the eastern slope of Colombia´s Central Andes, in an isolated peak locally known as the Alto del Tigre y de la Osa, 40 km upstream past the entrance to the Reserve. Along its course, Río Claro joins its forces with the Cocorná River, finally depositing their combined waters into the Magdalena, 57 km downstream past the Reserve. La Reserva Natural Cañón del Río Claro se encuentra justo al lado de la autopista Medellín-Bogotá, a tres horas en carro de Medellín, en el Km 152. O a cinco horas de Bogotá, en el Km 264.